"Can you believe this?" More than a few sports fans shouted those words during the final of the women's soccer World Cup this summer. The favored Americans, playing against a Japanese team trying to uplift its earthquake-ravaged homeland, missed a couple of easy opportunities in the first half, which ended with no score. In the 69th minute, however, American Megan Rapinoe lofted a perfect ball to the left foot of Alex Morgan, who put it in the net to give the U.S. a 1-0 lead. Japan had barely tested the U.S. up to that point, but in the 81st minute, they got the break they so desperately needed. The Americans failed to clear the ball out of the penalty area; Japan's Aya Miyama intercepted a weak pass and scored the game-tying goal. The thriller moved into extra time. An Abby Wambach header early in the extra session gave the U.S. a 2-1 lead: surely, most non-Japanese fans assumed, that would be enough. But give Japan credit for ratcheting up the drama. 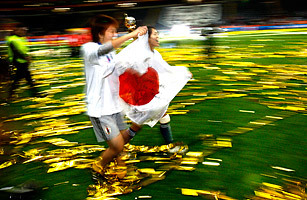 With about four minutes left until the Americans would be celebrating, Japan's Homare Sawa, playing in her fifth World Cup, scored off a corner kick as her momentum carried her away from the goal. The physics-defying score forced penalty kicks. The Americans imploded, giving the Japanese the World Cup. Back home, Japan erupted. "This is a turning point for Japan," said Kohei Kimizu, 28, shouting above the roar of a packed Roppongi crowd. "The U.S. has been ranked No. 1, so we didn't think we could win. It's a great day for the country."